The story of the Internet and its Things may seem as star-crossed a tale as any, but it does not need to be hopeless. 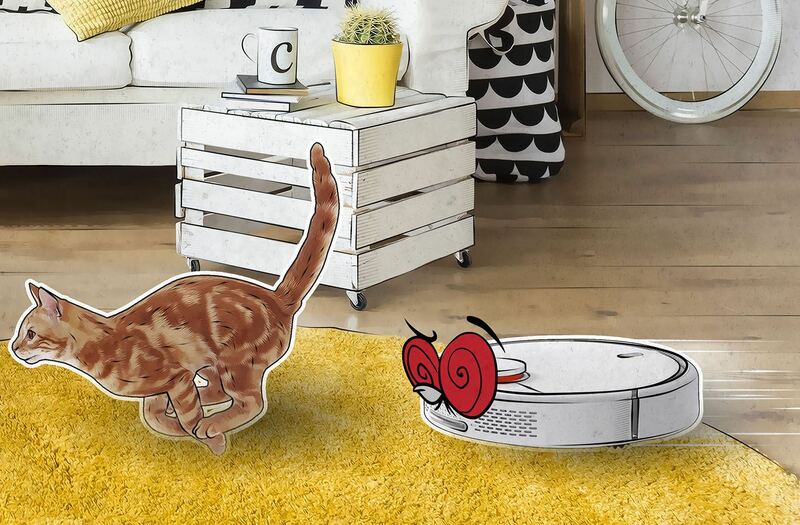 Although security researchers Dennis Giese and Daniel Wegemer eventually managed to hack into the Xiaomi Mi Robot vacuum cleaner, their research shows that the device is much more secure than most other smart things are. In their talk at Chaos Communication Congress 34, which was held in Leipzig recently, the researchers explained how the device’s software works and which vulnerabilities they had to use to finally crack its protection. When they started their research, Giese and Wegemer were amazed to find that the Xiaomi vacuum cleaner has more powerful hardware than many smartphones do: It is equipped with three ARM processors, one of which is quad core. Sounds pretty promising, right? So, for starters, Giese and Wegemer tried to use several obvious attack vectors to hack the system. First, they examined a unit to see if there was a way in through the vacuum cleaner’s micro USB port. That was a dead end: Xiaomi has secured this connection with some kind of authentication. After that, the researchers took the Mi Robot apart and tried to find a serial port on its motherboard. This attempt was likewise unsuccessful. Their second hacking method was network based. The researchers tried to scan the device’s network ports, but all ports were closed. Sniffing network traffic didn’t help, either; the robot’s communications were encrypted. At this point, I’m already rather impressed: Most other IoT devices would have been hacked by now because their creators usually don’t go this far in terms of security. Our recent research on how insecure connected devices are illustrates it perfectly. But cracking stuff open and hacking hardware is not nearly as cool as noninvasive hacks. After reverse-engineering the device’s firmware, the researchers figured out how to hack into it using nothing more than Wi-Fi — and a couple of flaws in the firmware’s updating mechanism. Xiaomi has implemented a pretty good firmware-update procedure: New software arrives over an encrypted connection, and the firmware package is encrypted as well. However, to encrypt update packages, Xiaomi used a static password — “rockrobo” (don’t use weak passwords, kids). That allowed the researchers to make a properly encrypted package containing their own rigged firmware. After that, they used the security key they obtained from Xiaomi’s smartphone app to send a request to the vacuum cleaner to download and install new firmware — not from Xiaomi’s cloud but from their own server. And that’s how they hacked the device again, this time wirelessly. Examining the firmware, Giese and Wegemer learned a couple of interesting things about Xiaomi smart devices. First, the Mi Robot firmware is basically Ubuntu Linux, which is regularly and quickly patched. Second, it uses a different superuser password for each device; there’s no master password that could be used to mass-hack a whole lot of vacuum cleaners at once. And third, the system runs a firewall that blocks all ports that could be used by hackers. Again, hats off to Xiaomi: By IoT standards, this is surprisingly good protection. The researchers also learned something disappointing about Mi Robot, however. The device collects and uploads to Xiaomi cloud a lot of data — several megabytes per day. Along with reasonable things such as device operation telemetry, this data includes the names and passwords of the Wi-Fi networks the device connects to, and the maps of rooms it makes with its built-in lidar sensor. Even more disturbing, this data stays in the system forever, even after a factory reset. So if someone buys a used Xiaomi vacuum cleaner on eBay and roots it, they can easily obtain all of that information. Concluding this post, it’s worth emphasizing that both of the techniques Giese and Wegemer used enabled them to hack only their own devices. The first one required physical access to the vacuum cleaner. As for the second, they had to obtain the security key to make an update request, and those keys are generated every time the device is paired with the mobile app. The security keys are unique, and it’s not that easy to get them if you don’t have access to the smartphone that is paired with the Xiaomi device you’re going to hack. All in all, it doesn’t look like the Xiaomirai is nigh. Quite the contrary: The research shows that Xiaomi puts much more effort into security than most other smart device manufacturers do, and that is a hopeful sign for our connected future. Almost everything can be hacked, but if something takes a lot of effort to hack, it’s less likely that criminals will bother trying — they are usually after easy money.